The Agriculture and Horticulture Development Board are currently in the recruitment process for six new arable farms to join their Monitor Farm Programme. This is the first time a farm in Northern Ireland will become part of the project. The programme aims to improve the performance and profitability of the host Monitor Farm and the wider industry as well as encourage openness and cooperation thereby building sector resilience. It brings together groups of like-minded farmers with a common interest in improving their farm businesses. There is already a network of more than 30 successfully run monitor farms across the UK. The farms allow for the transfer of knowledge both between farmers and from research into the industry. The host farm should be representative of other farms in the region. The team from AHDB will organise and facilitate the meetings but the scheme is owned by farmers and run by farmers. The selected farmer will open up their business to the arable business group. A steering group of three to four members will be involved in the on-farm decision making. The farm will become a focal point for group discussions and testing of new techniques. The ideal farmer to join the Monitor Farm Programme is someone who is willing to disclose information and open up their business, and share decision making with the wider farming community. The monitor farmer must be open-minded, receptive to new ideas and willing to embrace change. The project normally runs for three years and meetings will be held on the farm four to six times per year. 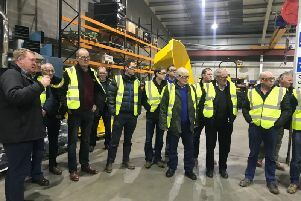 One of the particular highpoints for those in the Monitor Farm network – hosts and their steering groups – is the annual Monitor Farm conference, held in November. The Monitor Farm and visiting farmers will also be able to learn from independent, non-commercial experts discussing subjects that are of local relevance and which have been identified as priorities by the farmer group. Farmers interested in hosting a Monitor Farm should contact their Knowledge Exchange Manager by 31 December 2017. Judith Stafford is the Knowledge Exchange Manager for Northern Ireland. Contact Judith on: judith.stafford@ahdb.org.uk, 07981 556623. Interviews will be held in January and February 2018.